When you think about staying in a cabin, what comes to mind? If you've never vacationed in one of our luxurious cabin rentals in Helen Georgia, you may not hold a very high opinion of these types of getaway accommodations. Contrary to popular belief, however, cabins aren't the dilapidated and run-down shacks that you may have seen in popular horror movies. In fact, our cabins feature all of the creature comforts that you need to truly enjoy your holiday, and so much more. By booking a stay in one of our vacation rentals, you will be blown away as all of your expectations are exceeded. Many people believe that vacation cabins are usually neglected by their owners, and as a result, will be dirty, dingy, and falling apart. 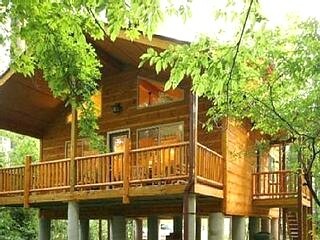 In reality, the cabin rentals in Helen Georgia are well taken care of for optimal comfort. The cabin rentals receive regular checkups by a professional maintenance crew, and are cleaned regularly so that visitors can truly feel that they are in their home away from home. No funky odors will be detected here - just the sweet aroma of the forest around you, as a soft mountain breeze flows through your cabin's windows during a mild summer day. Some folks avoid staying in the cabin rentals in Helen Georgia because they mistakenly believe that these vacation homes will be less comfortable than a standard hotel. They may think that the beds provided will be old, hard, and lumpy, making it difficult to get a good night's sleep. The truth is that our cabin rentals feature comfortable beds and mattresses so that our guests can get the rest that they need to recuperate for another full day of fun in the Helen area. Our cabins can sleep up to twelve individual persons on king, queen, double, and twin sized beds, depending on your need. Private bedrooms are available, as well as bunk beds for the kids and sleeper sofas. You may also request a cabin that provides fresh, clean linens so that you don't have to haul bedding from home. Vacationers who have never stayed in a luxury cabin may wrongly think that our cabins will take them back to the dark ages. These people worry that they'll be unable to enjoy air conditioning, heating, or electricity, and shudder at the idea of utilizing an outhouse. When you stay in the cabin rentals in Helen Georgia, you'll never be left in the dark. Our vacation homes offer electricity, which will not only supply power to your lights and your hair straightener, but will also allow you to listen to satellite radio, watch TV, connect to the internet, keep snacks cool in your refrigerator, fix a bowl of popcorn in your microwave, and more. You'll also enjoy climate control and hot, running water in your cabin's private bathroom or bathrooms. Do you shun the idea of vacationing in the cabin rentals in Helen Georgia because you think you'll miss out on the creature comforts that you enjoy at home? Folks who are not familiar with our rentals may believe that they'll be expected to "rough it" and live off of the bare essentials. You'll be amazed by what your dollar can afford you when you make the decision to stay in a luxury cabin rental in the Helen area. In fact, our rentals are so luxurious that you might even begin to prefer your vacation home to your house or apartment back in the city. The cabins are stocked with incredible amenities from the inside out, at no additional cost to you. For a price that is extremely comparable to a stay in a single-room hotel, you could rent a multi-story cabin with a loft and several bedrooms, bathrooms, a living area, a kitchen, a porch or patio, and the view of your choice. Imagine waking up each day to the sight of the northern Georgia mountains in the distance, your own private waterfall, or a peaceful wooded glen. You can even enjoy the spectacular scenery as you soak in your own private hot tub on your cabin's wraparound porch. You can select from cabins that offer barbecue grills, fire pits, creekside access, Jacuzzi baths, game rooms, fire places, and so much more. Have you stayed with us in the past? 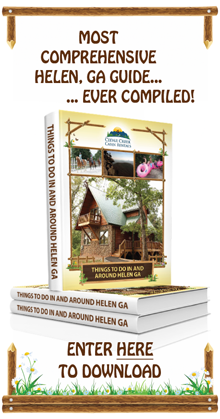 How did our cabin rentals in Helen Georgia exceed your expectations?